Improve capacity at the KY 18 (Burlington Pike) intersection with KY 1017 (Aero Parkway) to support existing traffic as well as economic growth. Consider grade separated options as well as non-conventional, at-grade intersection treatments. Include facilities to accommodate pedestrians and bicyclists. 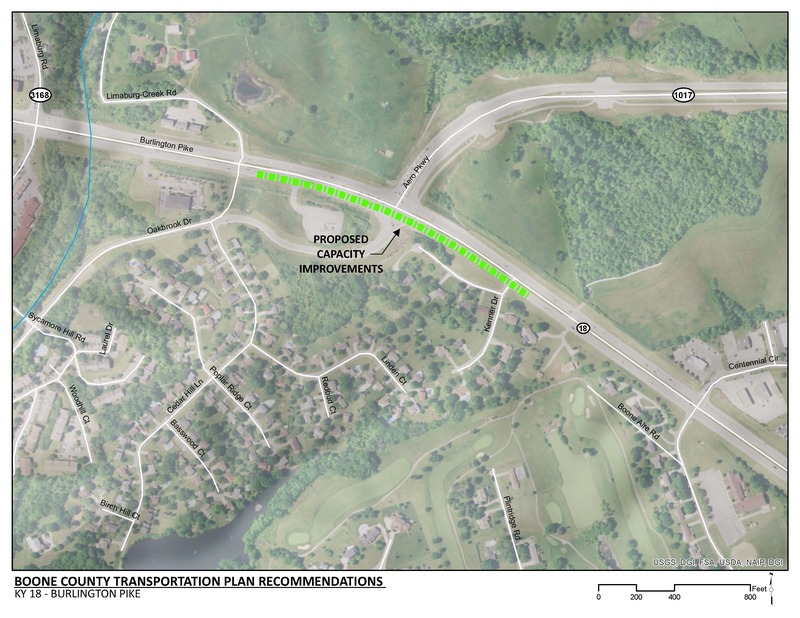 Improvements to the KY 18 (Burlington Pike) intersection with KY 1017 (Aero Parkway)/Oakbrook Drive will improve existing congestion and provide sufficient capacity to support planned development along KY 1017. Traffic flow along the KY 18 corridor will be improved by reducing delay at this intersection. The multi-use considerations included in this recommendation support Boone County’s goal of improving bicycle and pedestrian connectivity and safety throughout the county. Click HERE for a map of multi-use paths in Boone County. Future traffic demand analysis will be needed to forecast future traffic volumes and identify a preferred alternative. Due to the elevations of KY 18, KY 1017 and Oakbrook Drive, grade separated alternatives may impact planned economic development. There is an electric substation located on the south-west quadrant of the intersection. Impacts to this substation are estimated to be $10,000,000 and have been included in the cost estimate. The existing KY 18 (Burlington Pike) intersection with KY 1017 (Aero Parkway)/Oakbrook Drive handles heavy traffic volumes along KY 18 and KY 1017. Congestion is evident by cycle failures tp clear cues for heavy movements during peak hours. The heavy movement in the AM peak hour is the eastbound left turning movement from KY 18 to KY 1017. There are existing cycle failures associated with this movement. In the PM peak hour, the heavy movements include eastbound and westbound through movements as well as southbound right turns from KY 1017 onto KY 18. There is planned development along KY 1017 that will contribute to delay at this intersection. The KY 18 intersection with KY 1017/Oakbrook Drive serves adjacent commercial and residential land uses. The Amazon Air Prime Hub is planned at the Cincinnati/Northern Kentucky International Airport (CVG). Access to the development will connect with KY 1017. This development will generate additional employee and truck traffic on KY 1017. The frequency of crashes along KY 18 in the project area is 50% higher than the statewide average of similar roadways. Crashes along KY 1017 and Oakbrook drive are less than half the statewide average rate of similar roadways. There is a multi-use path that is planned along the north side of KY 18 that will terminate at this intersection. There is an existing multi-use path along the south side of KY 1017 and an existing sidewalk along the southeast side of Oakbrook Drive. TANK’s Fixed Route 32x runs along KY 18 through the project area.